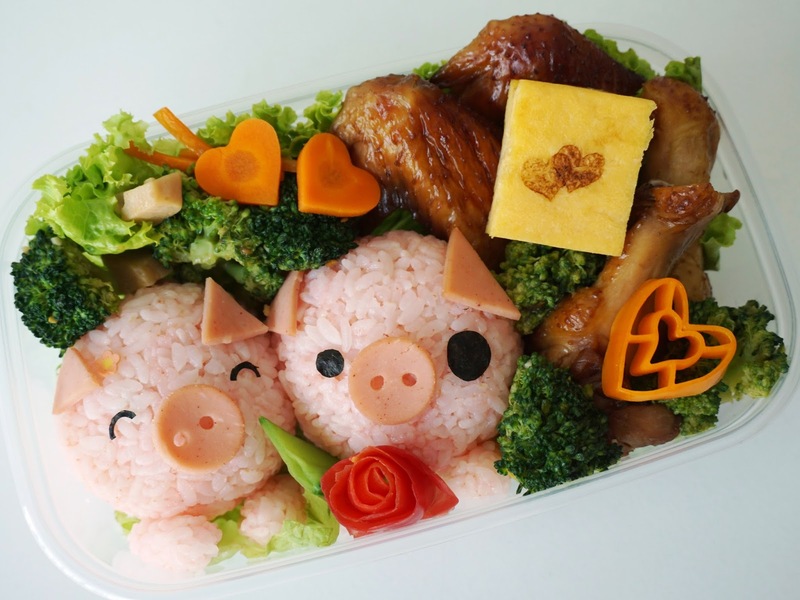 PinkyPiggu: Kawaii Piggies Bento! Recipe + YouTube Video + LittleMissBento's Kawaii Bento Recipe Book GIVEAWAY! 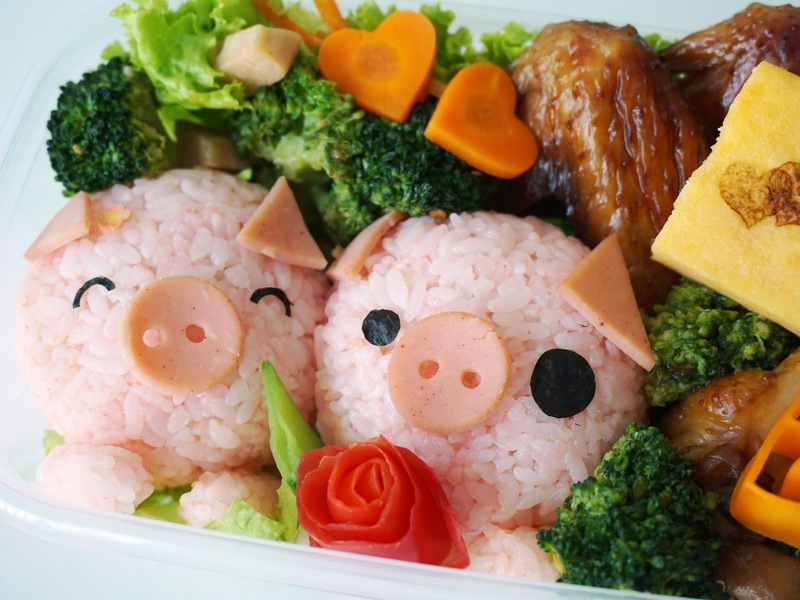 Kawaii Piggies Bento! Recipe + YouTube Video + LittleMissBento's Kawaii Bento Recipe Book GIVEAWAY! 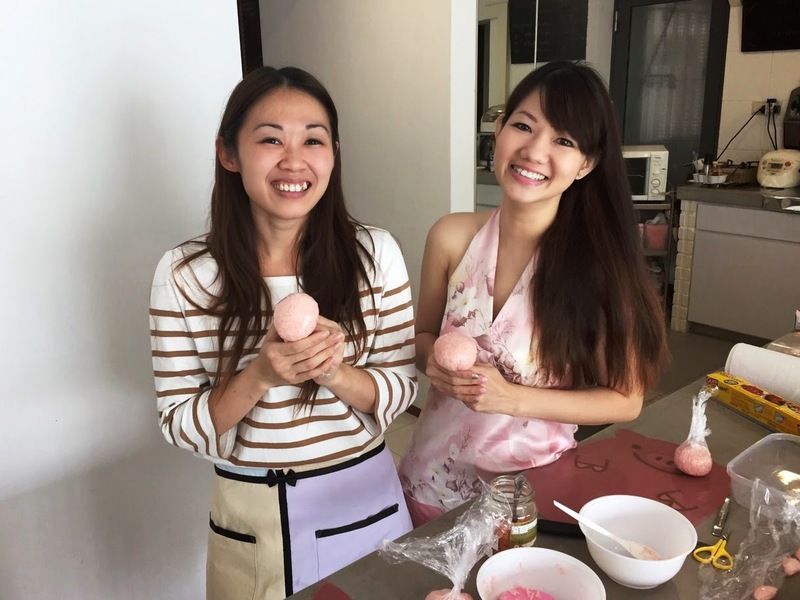 I first met Shirley back in 2013 when we were both finalists for Singapore Blog Awards - Best Cooking Blog. To be nominated in the same category as her is very much an honor for me, as supporters of Shirley would know that she runs a very popular blog called LittleMissBento and is a talented self-taught bento artist who recently launched her bento recipe book, Kawaii Bento! As we share the same passion for cooking, we thought it'd be fun to do a video making bento together. My special request: "Can I have something Pink for Valentine Day?" Look what Shirley came up with: Two pink piggies in love, completed with a tomato rose and my favorite chicken wings! Woohoo! I've made bentos before, but it's mostly lunchbox meals of convenience such as Basil Pork Rice or Kimchi Fried Rice, nothing at all like the pretty and adorable animal characters bentos which Shirley is well-known for. Would I have the patience for each tiny detail? Would my fingers be nimble enough to ensure my piggy look like a piggy? Haha those concerns became concerns no more as Shirley guided me through each step. Here's sharing the Kawaii Piggies Bento Recipe with you, together with our YouTube Video and LittleMissBento's Kawaii Bento Recipe Book Giveaway at the end of the post! Alternatively use sakura fish flakes to colour the rice instead of furikake and sakura denbu. Add the furikake and sakura denbu to your cooked Japanese rice, mix well for an even pink colour. Make 4 tiny rice balls of almost equal sizes. This is for piggies' hands. Divide the remaining rice into 2 portions and shape them into round oval rice balls. Tip: Using cling wrap allows you to easily shape the rice into compact rice balls for bento. Using small scissors or knife, cut 4 small triangular ham for the piggies' ears. Using a round cutter, cut 2 round cuts of ham for the piggies' nose. Use a straw to punch the ham, creating the nostrils. Using small scissors, cut the features of the piggies out of seaweed. 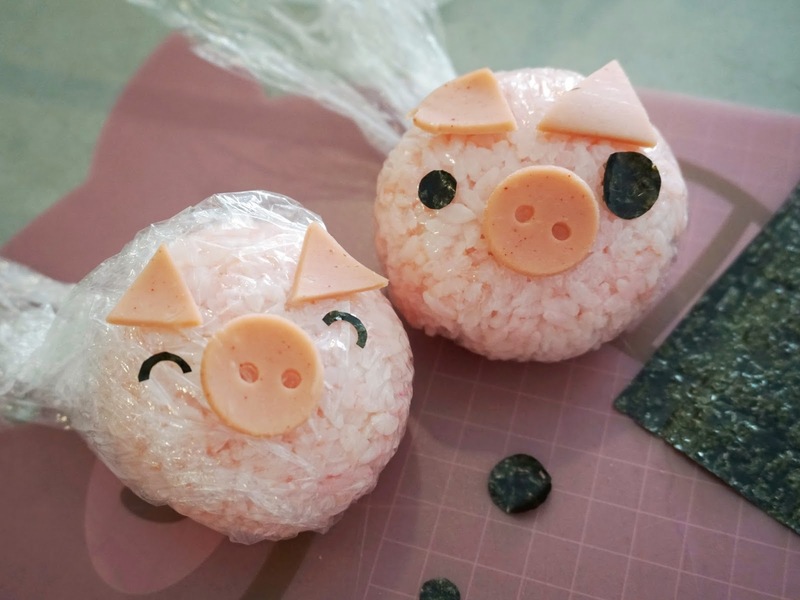 Assemble the details on the rice-balls to complete the piggy characters. Press the ham gently on the rice-ball to help it adhere better. If you need the parts to be very secured, you can secure with some deep fried thin pasta pieces. My first cutesy bento making experience was indeed loadful of fun! After the piggies rice balls were done, we completed the bento with baked chicken wings and sautéed vegetables. It was not as difficult as I imagined, much thanks to the clear demonstration and instruction by Shirley. I found out later, Shirley is the only Singaporean to be certified under the Japan Sushi Instructor Association in Tokyo. 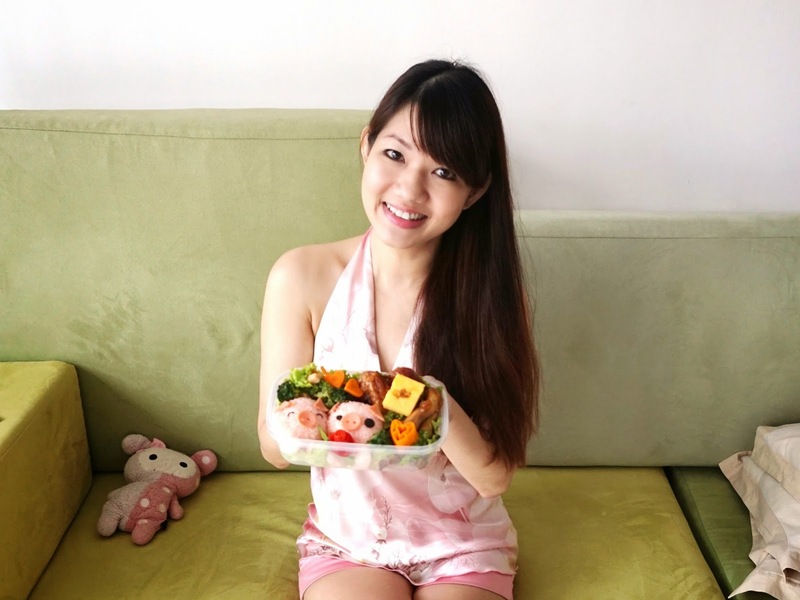 She conducts Bento Workshops on private 1-to-1 and small groups basis, as well as corporate bookings of up to 25 pax. It's also easy to pick up a copy of Kawaii Bento recipe book online or at any of our major book stores in Singapore, and start attempting to recreate the many creative bentos (Weather, Seasons, Special Occasion, Fairy Tale, Festival & Celebration, Animal & Nature Themes) featured within. Not only does it contain recipes and step-by-step guide to assembling and decorating the bentos, Shirley also shares a wide range of techniques and styles, with fully illustrated guide to bento-making tools and ingredients. Good things must be shared. PinkyPiggu is giving Two blessed readers 1 x Kawaii Bento Book each (worth $32 per copy), specially autographed by Shirley herself! Step 1 - LIKE PinkyPiggu's Facebook page. Step 2 - SHARE this post on your facebook page. Step 3 - COMMENT below why you want the recipe book. - All the 3 steps have to be fulfilled to be eligible for the giveaway. - Open to all readers residing in Singapore. - Giveaway ends on Sun 25 Jan 2015, 2359hrs Singapore time. - Two blessed readers will be picked by a random winner generator and name will be announced on Facebook/Instagram on Mon 26 Jan 2015. - The recipe book will be mailed to the winners' mailing address. I'd be running this giveaway on PinkyPiggu's Facebook and Instagram too, so join join join to increase your chances of winning! 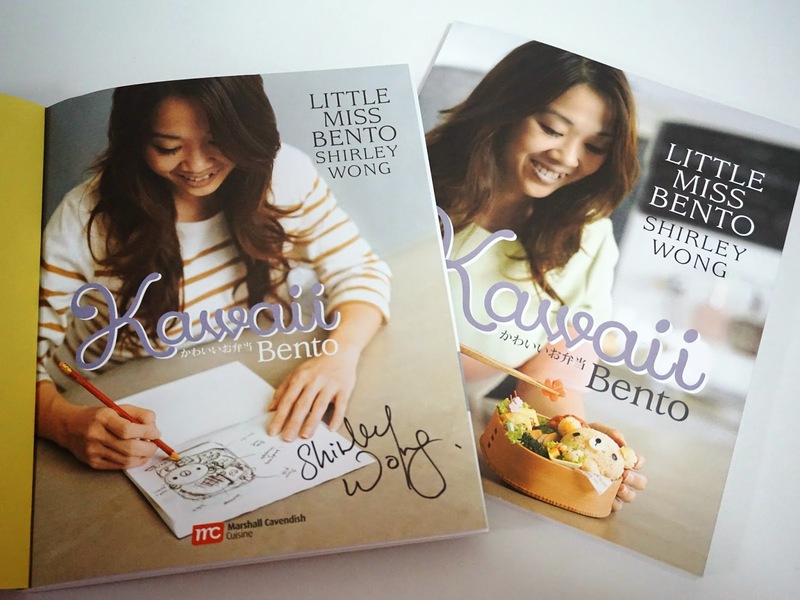 You might very well be the one to win an autographed copy of Kawaii Bento book! Lastly, here's the YouTube Video of us making the Kawaii Piggies Bento! Till the next time, bye! Thanks for arranging this giveaway. CONGRATULATIONS, Emily! You're the winner! Please email to pinkypiggu@gmail.com with your full name and mailing address so that I can send the book to you. Alternatively, you may also pick it up at Great World City (Mon-Fri, 10am-5pm) Thanks!